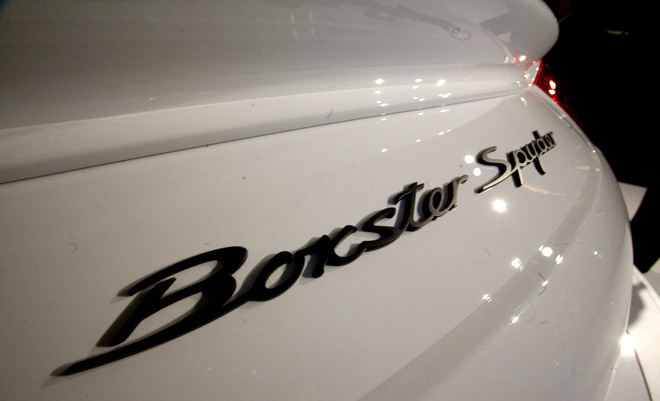 LOS ANGELES — Porsche divided loyalists with the polarizing Panamera sedan, but it will unify them with the stripped down, maxed-out Boxster Spyder that pays homage to some of the marque’s best cars. The Boxster Spyder that made its worldwide debut here at the Los Angeles Auto Show draws heavily from the best of Stuttgart’s mid-engined racers from the 1950s and 1960s, particularly the 550 Spyder, 718/8 (shown above) and RS 60. It tastefully updates those designs while also drawing from the Carrera GTsupercar. 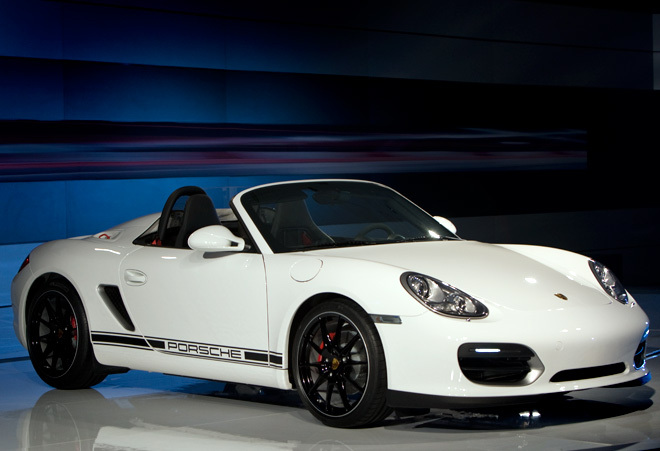 And like those cars, the Boxster Spyder is a minimalist machine designed exclusively for hard-core driving. With 320 horsepower and 273 foot-pounds of torque in a car weighing 2,811 pounds, the driving should be quite spicy indeed. The Spyder is the lightest car in Porsche’s lineup, a feat that required tossing everything that wasn’t absolutely essential to making the car accelerate, stop or turn. Cup holders? Absolutely not. Air conditioning? Forget it. Radio? Bring your iPod. 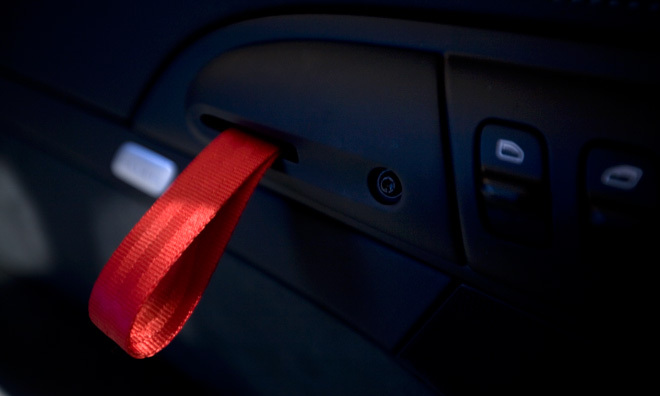 The Spyder doesn’t even have interior door handles – a bright red canvas strap hanging from each of the doors is all you need to yank them shut. Those doors, like the front and rear hoods, are aluminum. 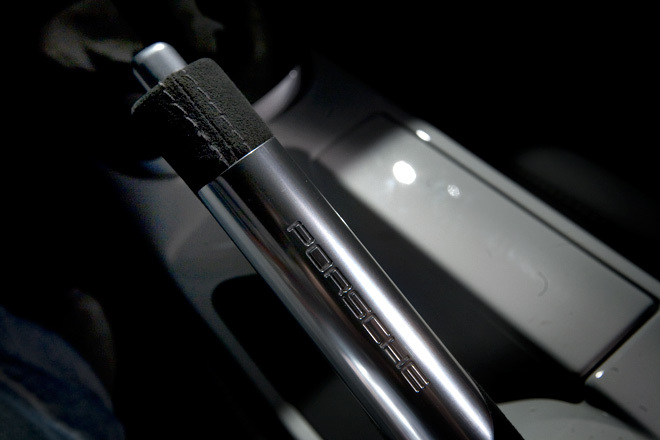 The 19-inch aluminum wheels weigh 86 pounds for the set, making them the lightest 19-inchers you can get from Porsche. The canvas top is stretched over a carbon fiber frame; the whole thing weighs just 13 pounds. 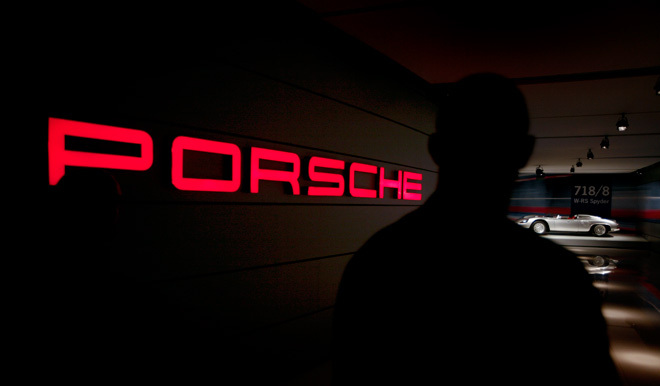 It’s a top in name only — it doesn’t seal the car, and Porsche says it’s only there to keep you from getting sunburned. 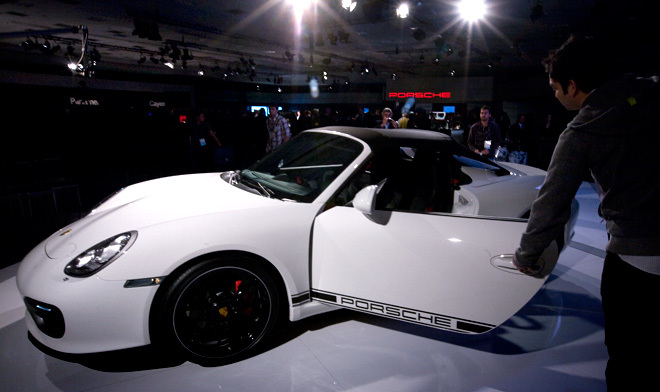 “Due to its design and structure, this light soft top is not suitable for use in an automated car wash,” Porsche notes. Yeah. No kidding. Packing a 3.4-liter six-cylinder engine with 320 horsepower into a car that light gives you a power-to-weight ratio of 8.77 pounds per pony. 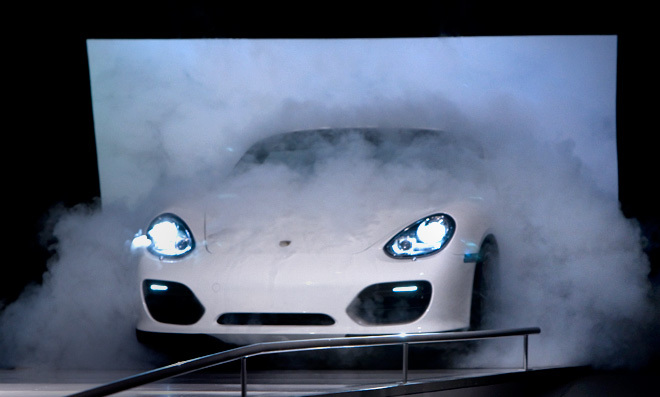 That’s better than the 911 Carrera S. Stomp on the accelerator and, Porsche claims, the Spyder will hit 62 mph in 4.8 seconds and top out at 166 mph. Put the top up and maximum velocity is governed at 124 mph. Anything more than that and the top might fly off like a bad toupee. The Spyder has a lower center of gravity — 0.8 inches, to be exact — than its siblings and it comes with a limited-slip differential. 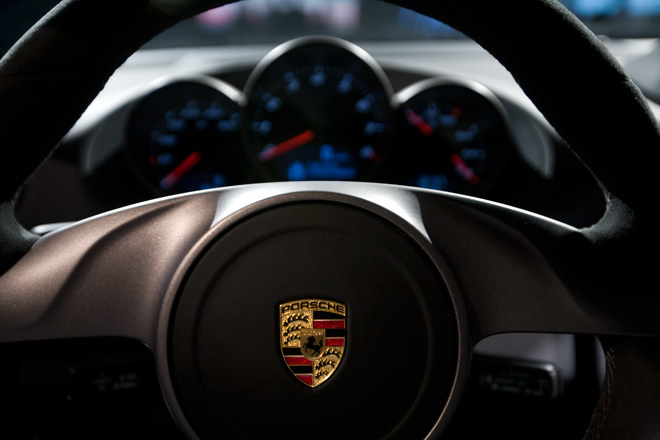 You can get it with the seven-speed PDK (That’s Porsche-Doppelkupplungsgetriebe. Easy for you to say.) double-clutch gearbox or a six-speed manual. Four-piston calipers squeezing 12.52-inch rotors up front (11.77-inch out back) bring you down from speed post-haste. Need more braking power? Get the carbon ceramic rotors. Look for the car in showrooms in February and expect to shell out $61,200 to get one.